Journalists who met Alex Nedd at the entrance of the Pigeon Point Heritage Park, Tobago, were struck by his warm demeanour. He hung garlands around their necks before inviting them to board a glass-bottomed boat for a sunset cruise to No Man’s Land, a ten-minute ride from Pigeon Point. The cruise was one of the last stops in Leve-Global’s Love Is In The Air lifestyle extravaganza, which was held at Villa Being, Arnos Vale, in early May. Aware of the event’s significance in projecting the island as an ideal romance destination, Nedd quickly endeared himself to the small, eager group. And they, in turn, responded with equal vigour. Nedd is the founder of Waterholics, a watersport business, which has been quietly making its mark on Tobago’s tourism landscape for more than a decade. “I would describe Waterholics as a one stop shop for all kinds of watersports,” Nedd, 36, told Sunday Newsday. The business, he said, offers a range of activities, including jetskiing, wake boarding, waterskiing, paddle-boarding, dolphin watching tours and trips to the famous Buccoo Reef and Nylon Pool. At No Man’s Land, Nedd and his team had a spread of delicious cuisine laid out for the group. However, it was the bonfire, one of the newest features to his portfolio, that caught the journalists’ fancy. “We cannot be doing the same things we have been doing over the years in promoting the tourism sector,” he said. A self-professed beach bum, Nedd has turned a childhood pastime into a successful business. He said he had always been exposed to water activities on the island. Nedd said he later became certified as a dive master and started taking groups out on scuba diving trips. After his brother, Richard, migrated to Germany, Nedd was faced with the decision to either continue the scuba diving business or diversify into water sports. He gravitated toward water sports, particularly jetskiing, but had to come up with a name for the business. 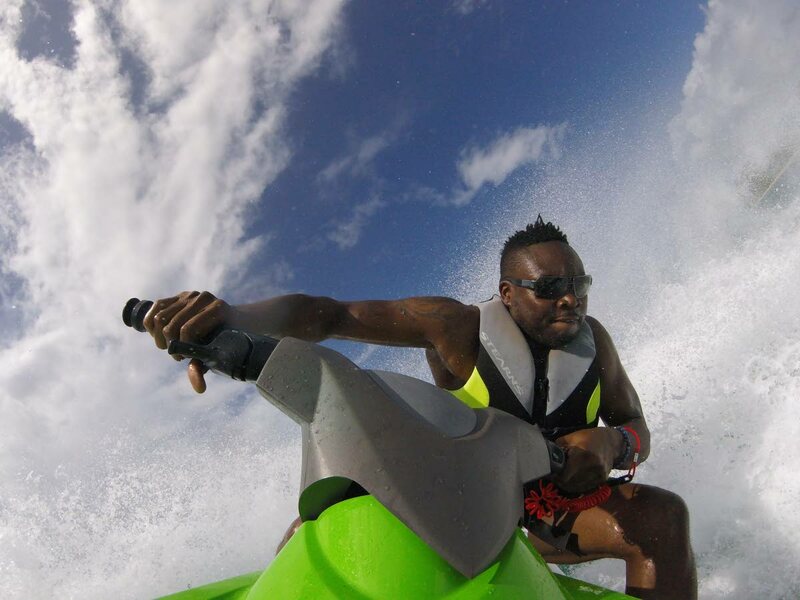 Nedd initially settled on Tobago Jet Ski Rental and Water Sports before renaming the business Waterholics in 2007. The business’ catchphrase is Just Add Water. Catering primarily to a foreign clientele, Nedd said Waterholics, a registered company with a logo and mission, has enjoyed much success over the years. However, he observed that business has declined, particularly within the last four years. He attributed the business’ success at that time to a consistent sea and air bridge. Nedd, who manages a staff of four, said things changed with the economic downturn and he began targeting domestic tourism. “But, the past couple of years has been very hard for us. Every year, we are seeing a decrease, especially in domestic tourism. Nedd said Waterholics also has taken a hit during the July-August vacation period. Saying that entrepreneurs on the island were complaining about the drop in patronage, Nedd said the recent woes on the inter-island sea bridge compounded the situation. Nedd reasoned that some people were reluctant to come for fear they would not have been able to return to their jobs overseas. He said the concerns were legitimate. He said soca artistes with booked performances also have experienced delays on the air and sea bridge. Apart from resolving the long-standing issues, particularly on the sea bridge, Nedd said the government must truly commit to diversifying the economy. For example, he said the Buccoo Reef, one of Tobago’s leading tourist attractions, must be marketed differently. “The tour has been conducted in the same style for the past 40 years. Nothing has changed. Nedd said as a young businessman, he has already realised the importance of innovation in business. He said he recently introduced an environmental component to his No Man’s Island tour, which has been well-received. He plans to execute a second phase of the campaign. He suggested that if No Man’s Land was in a country like Dubai, it would have already been a top tourist destination in the world. But Nedd has not been sitting on his laurels, hoping for a miracle to solve the problems confronting up and coming businesses in Tobago’s flagging tourist sector. Over the years, he has forged alliances with the island’s major stakeholders, including former tourism minister Shamfa Cudjoe and representatives of the Tobago House of Assembly. However, he lamented that new Tourism Minister Randall Mitchell has not yet visited the island. Saying Tobago had immense tourism potential, Nedd said small businessmen on the island were brimming with ideas but needed assistance. For his part, Nedd has vowed to remain resolute in the fight by tapping into new markets, especially North America. He said while Europeans still visit Tobago, many were gravitating to other destinations to save money. Tobago, he said, also needed to take some responsibility for its state of affairs. “Our hotels and service not getting better. So, we trying to accomplish more with the same thing, whereas everybody is ahead of us in tourism. Reply to "Marketing Tobago in a different way"